FlyGeorgia (Tbilisi) will introduce twice-weekly Tbilisi – Dubai Airbus A319 service on January 3. The airline is also planning to serve Berlin, Dusseldorf and Kiev besides the current service to Amsterdam. The expanding airline took delivery of its second Airbus A319 (4L-FGB) on November 21. The company announced in October it had signed agreements for the leasing of two Airbus A320s from leasing company AerCap . 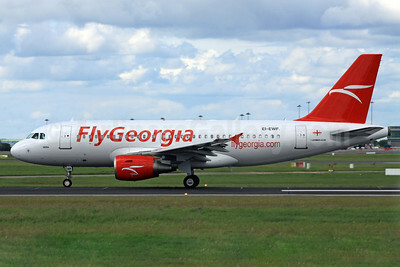 The first aircraft, A320-214 4L-FGC (msn 1439, ex OK-GEA), is due to be delivered to Georgia by the end of 2012. The second Airbus A320 will start serving the passengers of FlyGeorgia from March 2013. Copyright Photo: Paul Doyle. The first Airbus A319 is seen at Dublin before delivery to the company as 4L-FGA on June 29, 2012. This entry was posted in FlyGeorgia and tagged 3834, 4LFGA, A319, A319100, A319111, Airbus, Airbus A319, Airbus A319100, Airbus A320, aviation, DUB, Dublin, EIEWF, FlyGeorgia, FlyGeorgia Georgia, flygeorgia.com, transportation on December 29, 2012 by Bruce Drum. FlyGeorgia (flygeorgia.com) (Tbilisi) is planning to launch a new long-range route from Tbilisi to Amsterdam on October 6 with its Airbus A319. The carrier currently serves Antalya and Batumi from Tbilisi. Copyright Photo: Paul Doyle. Airbus A319-111 EI-EWF (msn 3834) is pictured at Dublin before it became 4L-FGA for the new Georgian flag carrier. This entry was posted in FlyGeorgia and tagged 3834, 4LFGA, A319, A319100, A319111, Airbus, Airbus A319, Airbus A319100, DUB, Dublin, EIEWF, FlyGeorgia, FlyGeorgia Georgia, flygeorgia.com, tbilisi on September 27, 2012 by Bruce Drum. FlyGeorgia (Tbilisi) launched operations on August 3 between Tbilisi and Batumi in Georgia with its first Airbus A319. The new airline has also announced it will start new routes from Tbilisi to Amsterdam, Kiev and Minsk before the end of the year. Copyright Photo: Paul Doyle. The first Airbus A319 is this A319-111 registered as EI-EWF (msn 3834). This entry was posted in FlyGeorgia and tagged 3834, 4LFGA, A319, A319100, A319111, Airbus, Airbus A319, Airbus A319100, aviation, DUB, Dublin, EIEWF, FlyGeorgia, FlyGeorgia Georgia, flygeorgia.com, transportation on August 7, 2012 by Bruce Drum. FlyGeorgia (Tbilisi) is a new airline which has taken delivery of its first aircraft – this Airbus A319. Formerly operated by Armavia as EK32007, A319-111 EI-EWF (msn 3834) is pictured departing from Dublin on June 29. It will become 4L-FGA and is being leased from ILFC. The airliner is named “Iveria”. A second A319 is due to be added shortly. The new privately-owned airline will offer full-service flights to Berlin, Dubai, London, Minsk, Rome and Vilnius. This entry was posted in FlyGeorgia and tagged 3834, 4LFGA, A319, A319100, A319111, Airbus, Airbus A319, Airbus A319100, aviation, DUB, Dublin, EIEWF, FlyGeorgia, FlyGeorgia Georgia, flygeorgia.com, transportation, travel on July 1, 2012 by Bruce Drum.